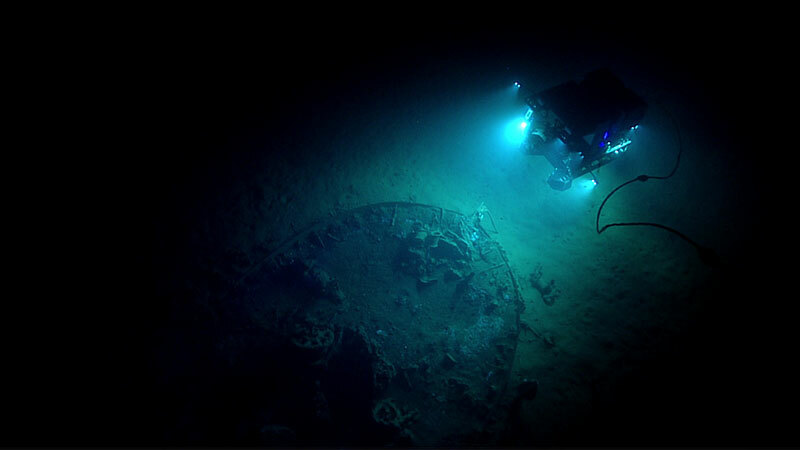 During the seventh dive of the Gulf of Mexico 2017 expedition, Deep Discoverer explored an unknown shipwreck identified by the Bureau of Ocean Energy Management simply as “ID Number 15377.” The ROV conducted a full survey of the wreck, collected imagery to generate a 3D mosaic survey, and documented biology living on the wreck. Based on initial observations, archaeologists believe the shipwreck likely post-dates 1830 and may have been a merchant ship built for distance over speed. Image courtesy of the NOAA Office of Ocean Exploration and Research, Gulf of Mexico 2017. Download larger version (jpg, 311 KB). From April 11 through May 3, 2018, a team of scientists and technicians, both at-sea and shore-based, will conduct exploratory investigations into the diversity and distribution of deep-sea habitats and associated marine communities in the Gulf of Mexico basin. The 23-day expedition will focus on acquiring data on priority exploration areas identified by ocean management and scientific communities. This is our final expedition planned in the Gulf this year before transiting back to the East Coast. 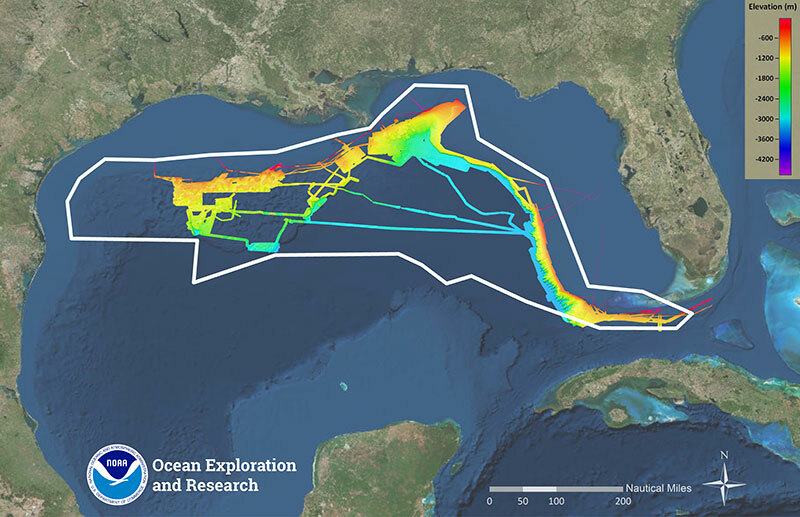 Through discussions and information stemming from NOAA and other stakeholders, priority areas have been identified for exploration, building on our Gulf of Mexico 2017 expedition. This expedition will explore deep coral and sponge communities, bottom fish habitats, undersea canyons, shipwrecks, and a variety of chemosynthetic habitats including cold seeps, mud volcanoes and brine pools. Using NOAA Ship Okeanos Explorer’s unique capabilities, we will provide scientists and audiences onshore with real-time video footage from deep-water areas in important, yet largely unknown, U.S. waters. The ship will conduct 24-hour operations consisting of daytime remotely operated vehicle (ROV) dives and overnight mapping operations. Operations will focus on priority ROV dive sites and mapping areas throughout the Gulf of Mexico. ROV dives will include high-resolution visual surveys and limited sampling. This expedition will help to establish baseline information in the region to catalyze further exploration, research, and management activities. Map of the general expedition operating area. The white polygon denotes the Gulf of Mexico 2017/2018 expeditions operating area for the Okeanos Explorer. The color-coded bathymetry shows cumulative multibeam sonar bathymetry collected previously by the Okeanos Explorer. Image courtesy of the NOAA Office of Ocean Exploration and Research. Download larger version (jpg, 13.4 MB). NOAA Ship Okeanos Explorer, the United States’ first and only federal vessel dedicated to exploration of our largely unknown ocean, conducts operations in a unique way, using telepresence to engage the majority of the science team on shore. Using telepresence, real-time video and other oceanographic data are transmitted through satellite and high-speed Internet pathways to scientists and stakeholders around the country. Scientists access the live feed by standing watch in Exploration Command Centers (ECCs), tuning in to the high-definition video via Internet-2 or watching the live video on standard Internet from their home institutions. Shore-based scientists interact with the ship through a teleconference line and Internet collaboration tools. Using these communication tools, scientists and students can contribute expertise and help guide the at-sea operations in real time, extending the reach of ocean exploration to more scientists and students than could possibly be accommodated onboard. Anyone with an Internet connection can follow along with the expedition as high-definition video of dives streams live to shore from ROV Deep Discoverer from April 12 through May 2, 2018. The same technology that allows scientists around the world to participate in the expedition from land also enables interested members of the public to experience deep-sea exploration, the wonder of discovery, and the fascination of science in real time. Additionally, mission logs, daily updates, educational materials, and multimedia elements will be added to the Ocean Explorer website throughout the expedition.